I finally put my 16' fishing boat back together and took it for a test drive last week. The boat is your basic 16' Alumacraft fishing boat with a 1977 7077S3 70HP 2 stroke motor and remote steering. With 2 small kids up front and at full throttle I couldn't get the boat to go faster then 7 mph/6 knots. I think the weight of the boat is pretty low. While there is a front and rear casting platform the casting structure was built using square hollow aluminum tubing and the platform is 3/4 plywood. Should the boat be able to go faster then 7mph? If so what's the best way to troubleshoot this? The prop seems to be spinning fine. Motor doesn't seem to be revving up as much as I would have expected. I say that because the largest motor I have owned to date has been a 15hp motor. I guess I will need to install a tachometer to verify if the motor is revving up correctly? You can also use an in-line 'visible' spark jump tester thingie (forget the proper name, but usually available on loan from some auto parts store) to check the viability of the coil/plug wires too. Get some plastic spark plug boot 'pullers' ... put OB to a fast idle - remove OB cowling - and remove plug wires one at a time. The RPMs should drop whenever a plug boot is pulled. If it doesn't, the coil/plus wire could be dead (see above) or the cylinder could have such low compression that it doesn't add to the RPMs, although it is firing. Sometimes swapping wires (BOTH ends!) from cylinder to cylinder can help you diagnose where the problem lies. NOTE to make this easier, BEFORE testing, w/ OB off of course, I apply dielectric grease liberally to the plug & boot. CAUTION ... moving parts - be careful! Do not use your hand or metal tool ... you WILL get shocked! Does she rev freely when not under load? If so you could have many issues starting with gears/oil compression and so forth. Does she rev freely when not under load? I'd personally try to never go above ~1600 RPMs in neutral unless by accident or momentary (a second or two or less), like if/when starting ... but there's NO WAY I'd ever intentionally put her over ~2K or so RPMs in neutral! How bout we start with propeller pitch? If it is the correct propeller then we can start troubleshooting the engine. 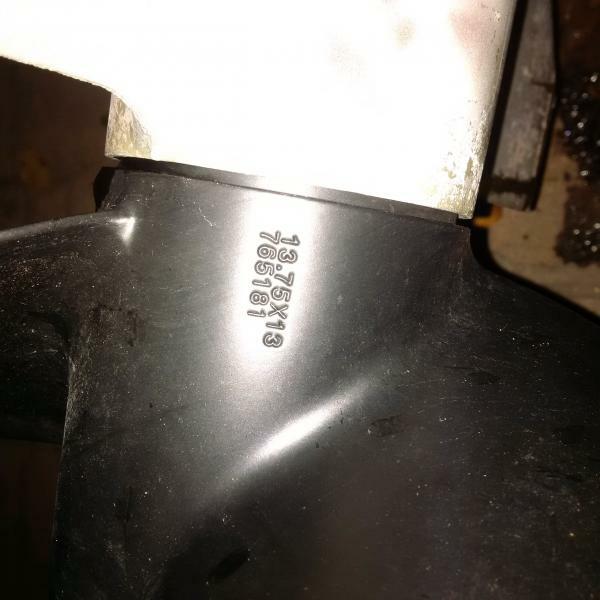 the propeller says Evinrude 18.75 x 13. I don't know if your wrong or right, I don't expect someone to run an engine in neutral for more then a second, just wanting to see if the RPM's go up or stay below an operating norm. I've seen many a dirt bike throttle up with the clutch not engaged and nothing bad ever happened. How many times do I see some dummy trying to warm up a cold engine in winter by revving her while cold, not a good idea but done often and by many. With that it's the cold part not the revving that's the problem (I think). Yes....the numbers you gave me are not correct. An 18.75" diameter will not physically fit that engine. Even the V8 engines did not have diameters like that. The first number will always be the diameter. Second should be the pitch. I realize that after almost 40 years the numbers may be a bit difficult to read but try again. I'm away for a for a few weeks. I'll see if the wife can find other numbers on the propeller. I made a mistake it's 13.75 x 13. It's an Evinrude 3 bladed aluminum propeller. The. manual says the out of the box propeller should have been a 13.25 by 17. Is this much of a difference? With that prop the engine should get the boat on plane. Thinking that the engine is not trimmed in or not running on all three cylinders at this point. Check and see if you can trim the engine in more if you think it is running on all three. If you think it may be the engine then you should start with a compression check and spark check. First place I would start is with the throttle linkage.Make sure you have full throttle movement . I have owned a a lot of johnson outboards. One common problem is the timing linkage sticks. When you apply throttle the linkage opens the carbs but there is a secondary linkage that follows the throttle linkage when when moved. It has a rod that goes up under the flywheel to adjust the stator to advance the timing. If it does not advance you get no power and low rpm. 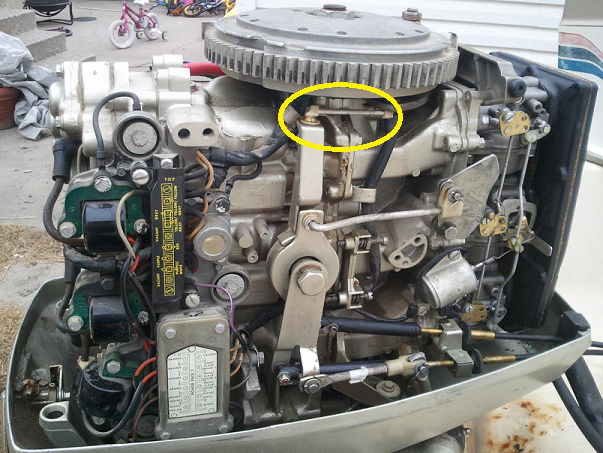 With the engine have some one move the throttle forward and make sure the part I circled in yellow move forward also. That will show if your timing is advancing as it should. Not sure if the test can be done with the engine off but if it can this is what happened. In neutral the lower cable is out about 1.5" and the top cable is entirely in. If I push the throttle forward the lower cable starts moving in (rearward) and stops when the throttle is 1/2 forward.